For the past year, UCSC alumnus and Art Department lecturer Noah Buchanan has been working to create two larger-than-life paintings for a new Renaissance-style church recently built in Wisconsin. 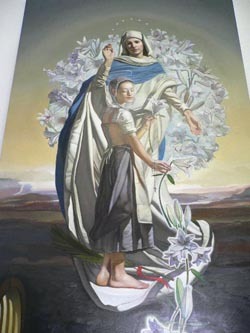 Next week, the 11-foot tall and 4.5-foot wide oil paintings will be carefully packed into a large wooden crate and shipped by truck to LaCrosse, Wisconsin, where they will be installed in The Shrine of Our Lady of Guadalupe. "It's by far the biggest job I've ever taken on in painting," says Buchanan. "I'm using traditional oil painting techniques from 17th-century Europe. I've gone through just a ton of paint--I had 14 to 15 colors on the palette." Because of the sheer size of the paintings, Buchanan rented a room with an extremely tall ceiling on the second floor of the old, historic Holy Cross High School building in Santa Cruz to complete the commissioned project. The canvasses were so large they couldn't fit in the studio--attached to his house in Santa Cruz--where he normally works. He was recommended for the job by a former professor from the Pennsylvania Academy of the Fine Arts in Philadelphia, where Buchanan studied classical painting and drawing for two years before enrolling at UC Santa Cruz and earning a B.A. in art. He went on to receive an M.F.A. in painting from the New York Academy of Art in 2002. At UCSC, Buchanan studied with professor of art Frank Galuszka, who coincidentally had also just moved to Santa Cruz from Philadelphia to join the UCSC faculty. "We had a great relationship; we really connected as teacher and student," said Buchanan. That relationship proved to be quite helpful for this particular project. Buchanan said that Galuszka, former chair of the UCSC Art Department, dropped by the studio on a weekly basis to offer suggestions and advice about the paintings. Buchanan said he has been working toward the goal of mastering painting techniques of the Renaissance and 17th-century Europe since he first began art school in 1994. For the past six years, he has also taught classes in painting and drawing at UCSC, Cabrillo College, and the College of San Mateo. "I think most people aren't aware of all the planning that goes into works like these," Buchanan noted. "There's just months of doing studies and drawings of all the elements. You're looking at other paintings and focusing on mundane details--such as if there's a brick floor in the painting, you need to look at a brick floor and rehearse exactly how it will look." Despite a great deal of anxiety and several false starts due to errors of anatomy and proportion, Buchanan said he is quite happy with how the two paintings turned out. "It was an emotional rollercoaster," he reflected. "I would liken the whole experience to some kind of sea voyage. You leave the port in really good form, but soon hit a huge squall and lose some people and equipment. After you refigure your goals and plans, you finally return to your initial port of origin and you're amazed--you can't believe you made it. And the ship is in entirely different shape. That's the closest thing to how it feels."